Silk Poster are printed full-colour onto 250gsm semi-gloss finish card (silk art paper). A0 (841mm x 1189mm) posters are an ideal size for internal and external advertising and point-of-sale applications. Commonly used in bars, nightclubs, restaurants, schools, churches and retail premises for promoting products and events. Silk Poster are printed full-colour onto 250gsm semi-gloss finish card (silk art paper). A1 (594mm x 841mm) posters are an ideal size for internal and external advertising and point-of-sale applications. Commonly used in bars, nightclubs, restaurants, schools, churches and retail premises for promoting products and events. Silk Poster are printed full-colour onto 250gsm semi-gloss finish card (silk art paper). 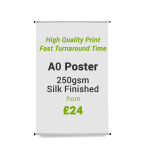 A2 (420mm x 594mm) posters are an ideal size for internal and external advertising and point-of-sale applications. Commonly used in bars, nightclubs, restaurants, schools, churches and retail premises for promoting products and events. Our A3 Posters are printed full colour onto 150gsm Glossy Paper or Semi-gloss (silk art paper). 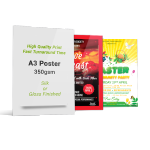 A3 (297mm x 420mm) posters are an ideal size for internal and external advertising and point-of-sale applications. Commonly used in bars, nightclubs, restaurants, schools, churches and retail premises for promoting products and events. Our A3 Posters are printed full colour onto 250gsm Glossy Paper or Semi-gloss (silk art paper). A3 (297mm x 420mm) posters are an ideal size for internal and external advertising and point-of-sale applications. Commonly used in bars, nightclubs, restaurants, schools, churches and retail premises for promoting products and events. Our A3 Posters are printed full colour onto 350gsm Glossy Paper or Semi-gloss (silk art paper). 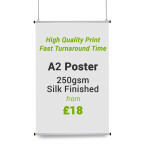 A3 (297mm x 420mm) posters are an ideal size for internal and external advertising and point-of-sale applications. Commonly used in bars, nightclubs, restaurants, schools, churches and retail premises for promoting products and events.